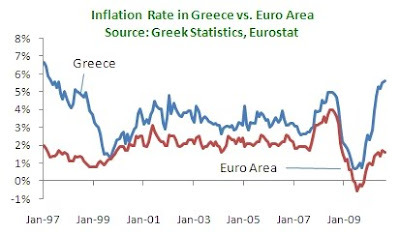 On September 9, the Greek Statistical Agency reported that inflation was 5.64% in August 2010, registering its sharpest year-on-year increase since April 1997 (using the Greek, rather than European, definition leads to a slightly lower number at 5.5%). Given that credit is highly constrained (see here), and that GDP shrank by 3.8% in Q2 2010, this inflation is not generated by too much money but by high taxes. High inflation has several implications. First, it contradicts what should be happening, which is deflation, as wages decrease and product market deregulation (still nascent) forces a downward revision in prices. That said, deflation should come later and this inflation is generated by taxes rather than loose monetary policy or too much demand. Second, inflation is squeezing households who are seeing, at the same time, wages stagnate or even decrease, credit being cut off as liquidity is low, and then prices increase. So households have less disposable income to begin with, have fewer options to smoothen their incomes via credit, and they need more Euros to buy the same amount of goods. Predictably, consumption is shrinking. 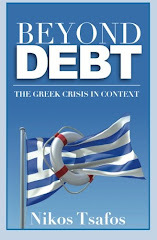 Interestingly, the base-case scenario agreed to between the Greek government, the International Monetary Fund, the European Commission and the European Central Bank forecasted that GDP in 2010 would shrink by 4%. So far, statistics show a contraction of 3% in 1H 2010, so this is *better* than the base case scenario. But the impact is more evident on government revenue, which is showing a shortfall of €2.2 billion relative to projected revenues (this is a 7% deviation). From January to August 2010, revenues increased just 3.3%, which is far below the 13.7% envisioned by the government plan. More than anything else this shows the real limits of taxation as a way to boost revenue.